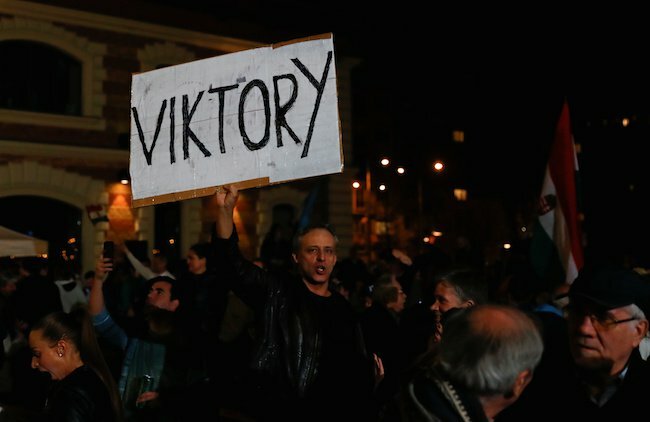 Hungarian voters handed a super majority to Orbán, who campaigned on a platform that [criticized the left-wing leaders of] the European Union and opposed [the mass migration from Africa and the Middle East to Europe that was instigated by German Chancellor Angela Merkel in 2015]. On thousands of billboards across the country, the Fidesz party put up a campaign ad that included a long line of migrants with a picture of a large “STOP” sign, reinforcing a major issue of concern for voters and highlighting the party’s hardline stance against more open immigration policies advocated by some EU leaders [which allow any refugee or economic migrant that makes it to any EU member country to apply for legal status]. 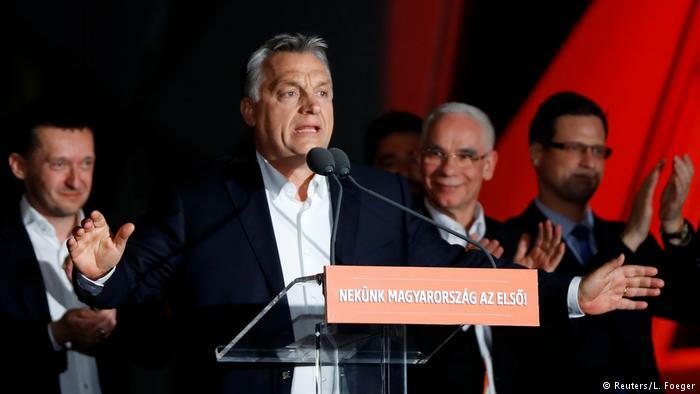 Orbán and Fidesz’s victory was praised by right-wing leaders across Europe, including the France’s Marine Le Pen and Netherlands’ Geert Wilders. “Orban is a blessing for this country, and also I think for the whole of Europe,” retired voter Karin, 65, told AFP on Sunday. Compiled from reports at UPI, AFP, Euro News and The Wall Street Journal. NOTE: Before answering the following questions, read the info under “Background” below. b) What percent of eligible voters turned out to vote? c) Prior to the election, Prime Minister Orban’s party held 132 seats in parliament. The Wall Street Journal wrote “Orban’s party risks losing its hold in parliament.” How many seats did his party win in this election? d) This is the third super-majority Mr. Orban’s party won. What do you conclude about Hungarian voters’ view of the European Union’s “open door” migrant policies? As a 26 year-old law student in 1989, Orban stood up to the Communist regime of the Soviet Union, who at that time controlled Hungary. He gave a stirring speech demanding democracy and that Soviet troops go home. Co-founding the Alliance of Young Democrats party (Fidesz), Orban was one of “new” Europe’s leaders, becoming an MP in newly democratic and optimistic Hungary in 1990. 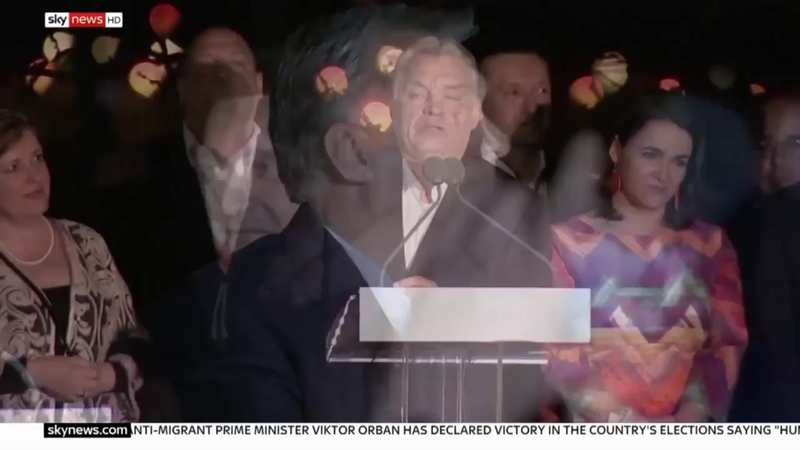 Orban developed a rare knack for connecting with ordinary voters. He was elected prime minister in 1998 at just 35. This time, armed with a two-thirds majority in parliament, Orban implemented a …reform of Hungarian state institutions and introduced a new constitution steeped in conservative values. Orban says that he had to repair years of left-wing mess. 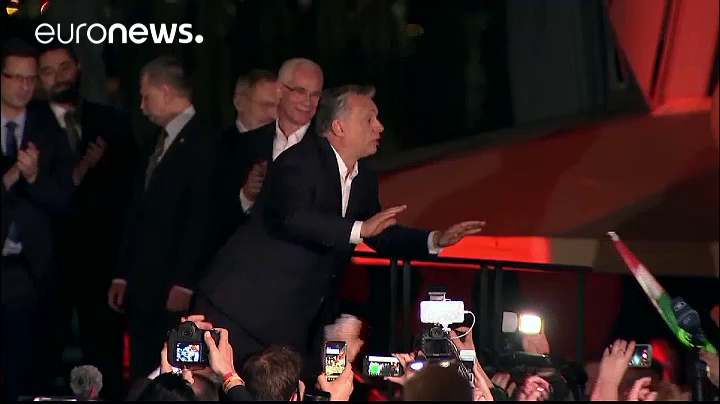 He was re-elected in 2014, again with a super-majority, and Europe’s migrant crisis the following year saw Orban [stand up in] opposition to German Chancellor Angela Merkel’s “open-door” refugee policy, [which saw not only refugees but hundreds of thousands of economic migrants from North Africa inundate Europe]. As hundreds of thousands of people streamed through Hungary bound for western Europe, and with Budapest train stations resembling squalid refugee camps, Orban erected a fence on Hungary’s border with Serbia. Illegal immigration — a “Trojan horse for terrorism” — was made punishable by lengthy jail terms. It was Hungary’s duty to defend the outer frontier of Europe, just like against the Ottomans in the 17th century. Orban’s strident stance has turned Hungary, along with Poland’s like-minded government which has also raised concerns with its own reforms, into a headache for Brussels [the left-wing head of the European Union] and the rest of the EU.